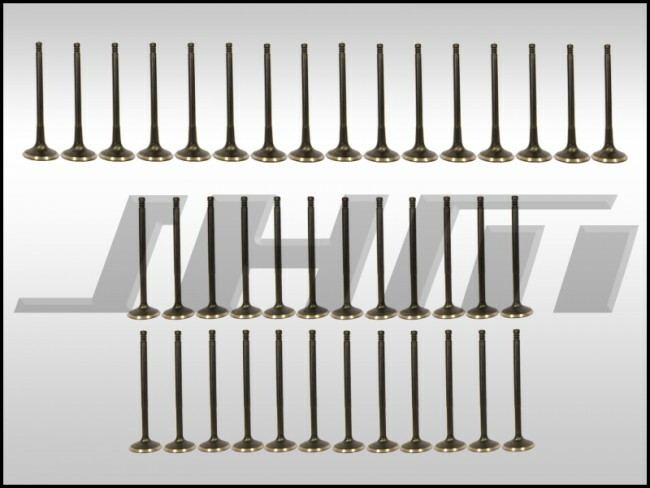 These JHM Heavy Duty, Coated Intake and Exhaust Valves are included in our Rebuilt Heads for the B6-B7 S4 4.2L V8. Our JHM Heavy Duty performance valves are upgraded in nearly every way over the stock Intake and Exhaust Valves in the B6-B7 S4 4.2L V8. Our JHM HD Performance Valves feature our proprietary valve coating. This coating is a multistage, nitrocarburizing treatment with superior lubricity that also increases corrosion and wear resistance. This makes the JHM HD Performance Valves exactly what you want the surface of your valves to be: slippery, hard, and tough. Additionally, the stock valves have almost ZERO margin which makes them nearly impossible to service unless you were regrinding super low mileage valves. However, there's really no reason to ever do that. Our JHM HD Performance Valves feature more margin for longer serviceability and longer life. This allows for a greater possibility of being able to regrind your JHM Valves during a future rebuild (depending on mileage). The larger margin also gives the valves more durability to withstand the heat of high performance or boosted applications. We also beefed up the Intake Valve Stem in response to the high rate of Intake Valve failure we have seen. Stock, these intake valves break very easily at the stem and cause catastrophic damage to the cylinder wall and piston, rendering the motor un-repairable. 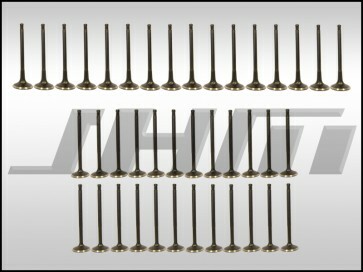 Our JHM HD Intake and Exhaust Valves are 21-4N stainless steel and single piece. Stock, the Exhaust Valves are two-piece. With a very small increase in stem diameter at the base of the valve, the strength of the valves is dramatically increased. Additionally, we had these valves tested on a cylinder head flow bench and the increased valve stem diameter resulted in a negligible amount of flow loss. In our testing, the resulting power numbers were the same as stock. 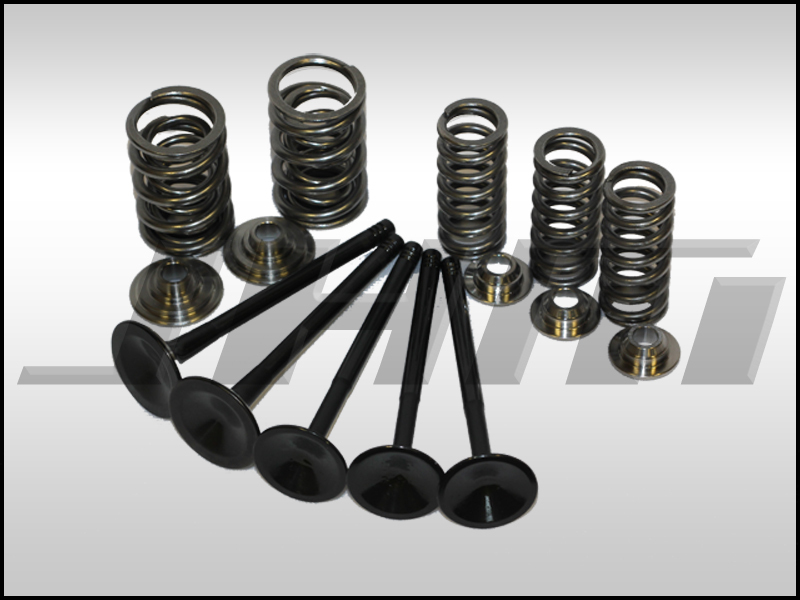 Any negligible weight increase in the valves due to our improvements in the design, has been counteracted by increasing the dish in the head of the valve, making them still compatible with stock valve springs. Additionally, with our Fully Rebuilt Heads, the massive weight loss from the Titanium Retainers makes the resulting combination dramatically lighter than stock. NOTE: This picture also shows our brand new Heavy Duty, High Rate, Performance Valve Spring and Ti Retainer Set which is included in our Rebuilt Cylinder Heads or available for sale separately. For shipping quotes, please sign in or create an account then put the items you want in your shopping cart and proceed to checkout.